Back in 2010 I wrote a blog entry about what TV would look like in ten years – we’re seven years later and pretty close to my predictions, but things are still pretty scattered. To get there, you’ll have to do lots of configuring and there are no truly “cheap” options. So let’s have a look at what you can do about cutting the cord (or satellite) in 2017. First: All of them have voice commands now, and most of them do it pretty well and they all basically work the same way. Don’t be fooled by the fact that Amazon calls their voice command function “Alexa” and Apple calls theirs “Siri” these actually don’t play into your existing amazon Echo or Apple devices. All of them can be configured to work with universal remotes like harmony and in most cases (depending upon the model) they can be controlled using apps from your phone. (we’re talking about the 4th generation): Best all around, but most expensive. Uses airplay, so if you have iPhones, iPads, or Mac computers you can stream anything; audio, video, or mirrored displays – directly from those devices to your TV without any extra wires or configuration. It just works. It’s also the only device that will work natively with your iTunes account, so if you have lots of movies or TV shows purchased through iTunes this is the way you’ll want to go. 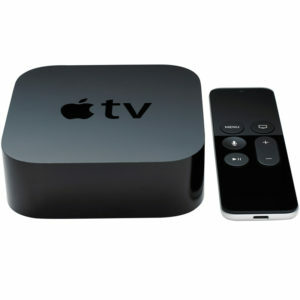 Also the Apple TV has a native app called TV that works with other TV apps to make it easier to search for content across several different sources – this works similar to the amazon fire TV, though I prefer the Apple TV interface; it’s smoother and integrates with your iPhone to allow you to input text instead of having to scroll through the alphabet. The remote is the best of any set-top-box. It comes with a lightning charging cable and the top half is a track pad that allows for quick, precise movement across the screen. 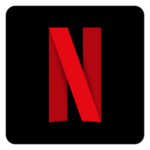 Netflix, Hulu, and apps for most major broadcast networks are all available here and more and more subscription content is available all the time, especially for sports fans. Perhaps the biggest downside to the Apple TV (besides the higher price point) is the fact that there is currently no native Amazon Prime video app. Though, I’d imagine this would come eventually, there’s been no announcements of plans to make one. However, because of airplay you can always just open the amazon prime video app on your phone, iPad or Macbook and stream it from there, making it a minor problem in the end. Over all I recommend the Apple TV because its from the most time-tested brand and even though it’s a little bit more of an investment, think of it as being 1-2 payments of your cable bill and you realize, it’s still pretty inexpensive. The Roku really was the first Set-Top-Box to really succeed and the fact that it’s become its own brand and still competes with the likes of Amazon and Apple shows that they’re making a quality product. 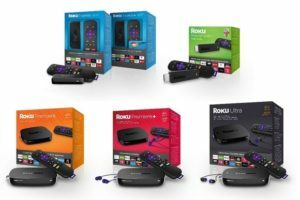 There are currently five different Roku products, which is confusing because there really only needs to be two. The Roku “Stick” is only $50 and is a great device, but its older brother the Roku “Ultra” has voice commands, 4K, HDR streaming (making it the highest picture quality set-top-box), and the remote can be used as a wireless audio controller so you can watch TV with your earbuds in and not disturb your baby (or husband) napping in the other room. All the apps are here; Amazon, Netflix, Hulu, and most others. Roku is a great device, and if I were writing this a year ago I would say that it was a good deal, but today Roku is probably the least impressive device when it comes to control and interface and it’s no longer the best quality or the least expensive. It all looks good, but it’s just not as smooth as the other two and as Amazon Fire TV and Apple TV have become more popular it seems like Roku doesn’t offer many advantages; Amazon fire TV is cheaper and works well with Amazon prime, Apple TV offers a better interface and works well with the Apple ecosystem. Unless you get a really good deal on it, I wouldn’t recommend the Roku at this point. The Amazon fire TV is without a doubt the best over all value; for $90 you get a player capable of 4K video with voice control. The Amazon fire stick is the cheapest player and, having used it myself, I couldn’t tell a big difference in the speed of the interface between the Fire Stick and the Fire TV. While it’s not as smooth or slick as the Apple TV, it’s still very stylish and easy to use. It doesn’t have airplay, or iPhone integration, but if you just want something inexpensive this is the best way to go. The Amazon Fire TV box’s image is actually 4K, though I haven’t seen the 4K quality version in action – I’d suspect it’s solid. If you need 4K then this is the best way to get it. Also if Amazon Prime is the main source of online content for you, you’ll want to get this box as that’s what it is built for. One last thing to keep in mind with all of these: They all run great over wifi if you have a a good strong signal, but you’ll get a better connection over hard-line ethernet and the stick versions only run on wifi. If you have a hard line near your TV I’d go with one of the boxes and hook it to your network that way. If you don’t get good wifi in your TV room and you don’t have a hard line, you’ll want to get something to boost your wifi signal or run a hard line before proceeding. You already have Netflix. I don’t need to tell you that it’s really the best streaming service out there for original content as well as syndicated classic TV. Yes the price has gone up consistently over the years, but so has the quantity and quality of content. For $8 you can go with one screen SD service, but you’ll probably at least want the $10 HD 2-screen service. Netflix is offering almost all new content in 4k via the new $12 premium service. The service also has an exclusive deal with Disney where they will get all new Disney films streaming before any other service does; that includes Pixar, Marvel, and Star Wars films. A few shows you might want to check out that are only available on Netflix: Travelers, The Crown, Fuller House, Arrested Development, Daredevil, Voltron, Danger Mouse, and Stranger Things. Plus they have Friends, Frasier, and Cheers. 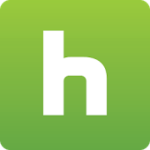 If you don’t want to bother with getting an antenna to enjoy most of the content available on three of the five of the major broadcast stations (ABC, NBC, FOX) then you’ll want to go with Hulu. It’s not the best deal, but they’re working on getting more exclusive content. Shows to check out on Hulu: Brooklyn 99, Saturday Night Live, The Tonight Show with Jimmy Fallon, Emerald City, Agents of Shield, Smallville (complete series available), Blindspot, the Good Place, Drunk History, and tons of reality shows that I don’t care about, but you may. If you want current TV shortly after it airs and you don’t want to bother with an antenna, this is the simplest/cheapest way to do that. The downside is that while $8 gets you HD, it does have commercials that you cannot skip. For $12 you can skip the commercials. There is no 4K option. Little tip: don’t subscribe through your Apple TV, iPad or iPhone as it can add a $1 monthly “convenience fee,” instead log on using a computer. Of these “big three” Amazon prime offers the smallest exclusive library of shows, and really if you like movies at all you probably own all the movies they offer by the time they offer them. There are a few original series that are ok, but none at the level of Netflix. The only reason I have prime is for the two-day shipping and I think I’ve actually watched two movies and a couple episodes of their original shows, but I have every reason to expect that their library will improve as time goes on. As the service also includes the shipping perks, a small library of free ebooks, and amazon music (Hamilton sound track! ), this one really does give you the most ROI, even if not in the area of video content. Sling is a different animal. It is not an on-demand service like the others, but rather basically an internet-based cable TV service. As of the publication of the post It offers no options to pause or re-watch content, this is totally just for live TV – especially for cable channels, the content for which you can’t get over air or through other services. There are three different tiers. Basically the first tier, “Orange” has all of the Disney-owned stations (Including ESPN) plus a smattering of others for $20. The second tier “Blue” has Fox and NBC’s related networks (Including Fox Sports and the NFL network) plus the same smattering of others for $25. For nerds, Orange has BBC America and Blue has Syfy. The upper tier is all of Sling’s available channels for $40, though at that point you could get the lower end Direct TV with DVR for about that much. The main advantage of sling over cable or satellite is they don’t do the rate hike after a year of service, though there is no realistic guarantee their rates will never go up in the future, this is pretty nice. If you don’t mind calling the cable company every year though, you can keep your rate at about this level and have more channels plus DVR. You’ve probably seen the set top antennas bragging about how they can get you dozens of free channels at higher quality than cable. While over the air (OTA) options are generally higher quality than most cable options, you’re never going to get “dozens” of channels with an indoor antenna. If you’re really looking to cut the chord and want something reliable, I don’t recommend getting an indoor antenna at all for a few reasons: First you have to buy one for every TV: to get a good one for every TV means that you’ll need to spend $15-$30 per set. Second, reception is going to be limited due to their location and it will vary greatly depending upon the weather. And finally they’re obtrusive and the most effective ones tend to be ugly. Yes, you can usually get 1-5 local stations with a nice, flat window antenna, but if you want to get all the stations in your area clear and reliably there are few better options. And these do require some significant set up, but once you’re finished then you’ll have free and very good TV for a long time. First with either of these options I recommend visiting TVfool.com and using their TV signal tool. It will generate a PDF telling you what direction you need to face your antenna to get what channels. It will also tell you how strong the signal is for each station so you know what to expect and what kind of antenna you’ll need to get each channel. If you already have a satellite on your house this is a super easy option because it is taking advantage of your existing wiring. Buy the best outdoor antenna you can afford and a mast. I recommend getting at least a double bowtie antenna as you can use the info you got from the TVfool signal report to face it at two different directions and receive signals from multiple places. Remove your satellite and put the antenna on the mast in its place. If you have a small house and only 1-2 TVs you might be able to get by with just taking the signal strait in off the antenna using a simple coax splitter, but if you’re looking to supply TV to a medium-sized house or to three or more TVs you’ll want to get an RF amplifier to split the signal and make it stronger. You may already have one in place, if not they’re $40-$80 depending upon how many sets you have. Wherever your satellite cable is fed to into your house (usually its your attic) you’ll want to place the amplifier there and use it to send the cable elsewhere. Look, I can explain this all to you, but I’ll probably make it sounds more complicated than it is. Just find where the existing wiring is and use it. Google it if you need more info. If you don’t have a satellite or ladder – or if your HOA forbids you from putting a big antenna on your house, an attic antenna is usually a pretty easy option that won’t lower the curb appeal. 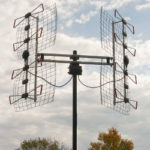 Most outdoor antennas can be used as attic antennas, so my recommendation stays the same: a double bow-tie antenna is your best bet for capturing more signals, but since your attic probably isn’t big enough to accommodate the double bowtie, you could either settle for two singles and a combiner or one single. By the way, you might want to make sure you have a good place to mount it in your attic before purchasing. The one pictured is nearly 4 feet long – you may also want to buy a small mast to get it clear of your roof and rafters and as high as possible. Face the elements based on the report you got from TVfool.com. Then use your existing cable wiring to hook into the rest of your house. There is almost always an access in your attic to your cabling. Again you may want to buy an amplifier if you have a medium sized house or if you’re distributing to three or more TVs. Be sure to experiment with different locations before you drill holes. Get someone to stand up stairs with it and try a few different locations with the element facing the directions recommended by your TVfool report. and scan for channels. This is a hassle, but it will be worth it when you get a better signal. 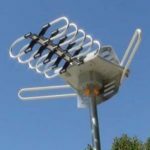 If you live in the middle of nowhere you might want to use the TVFool.com report to guide you as to where to place multiple powered single-direction antennas and combine those signals using a UHF/VHF combiner. This is a pretty advanced option but can result in getting lots of channels from over a hundred miles away. 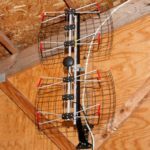 A less expensive, but more complicated option along these same lines is to get a single high-gain antenna with a rotor that moves the antenna from indoors so you can re-position it as needed. Again, this is really only if you live in the middle of no where, or if you just like getting channels from neighboring states. If you do this, you should probably get the lifetime subscription deal that Tivo offers. Plug the antenna into the Tivo, and you’re done! TiVo also has the best interface for a DVR. It does have the ability to access Hulu, Netflix, and Amazon prime, but these apps are not going to run as smoothly on TiVo’s box as they would on an Apple TV, so bear that in mind. As an added bonus, the Roamio can be controlled with your smartphone. To expand to other rooms you have to buy a TiVo Stream ($150.) There is an app where the Tivo can be streamed via Airplay to an Apple TV or Amazon Fire TV however a TiVo stream is still required.So you need at least one of them to do TV on multiple place and you might need more than that depending on how you want to scale your system, if you have three TVs. Really this is the best option all around for an OTA DVR right now, for $400 you get a 1TB DVR with no added monthly fee. Tablo 4: Good for gearheads and owners of multiple Set-top-devices. If you want to access your Over-the-air DVR recording from multiple TVs, or from you tablet or phone, then the Tablo 2 ($190) or Tablo 4 ($300) systems are a great choice. The 2 has two tuners, meaning that you can watch one thing and DVR another or have two people watching two different things off of one Tablo. The Tablo four has four tuners so if you’re planning on accessing your Tablo on more than one device you might want to go with the 4. 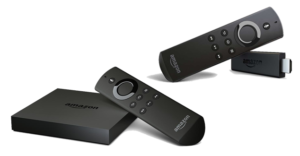 This type of system scales cheaply – to add another TV you just buy a FireTV stick. You can also do some of this with a Tivo by buying Tivo Mini’s, but it will end up costing more. The number of tuners determines how many programs total you can have being DVR’d/watched live at the same time. What’s also cool is that as long as you’re in range of your house’s wifi, you can actually watch your over-the-air TV on your phone(s). A small, but substantial advantage to accessing Tablo through your Apple TV, Roku, or Amazon Fire TV is that you don’t ever have to change inputs on your TV – you select the Tablo app when you want to access Live over-the-air TV or your DVR, then hit back on your remote and your on to netflix without having to swap to a different input. The less than awesome thing about Tablo is that while it works great once it’s up and running it can be a bit trickier to get set up and requires you to purchase an external hard drive. (I had one laying around so I didn’t need to spend the extra cash) And while you can use the DVR system without subscribing, to be able to see more than a day in advance and get programming descriptions you need to pay either subscribe to a $5 monthly fee or purchase a lifetime membership for $150. That plus a hard drive, and a streaming device (if you don’t have one already) and you could easily spend $550+ getting what you basically get for $400 with TiVo – again, UNLESS you’re planning on doing this on two ore more TVs as TiVo requires you to buy a TiVo stream ($150) to scale this to other rooms. So what does Will Adams think? Well if you already are getting a set-top-box like a Roku, Amazon, or a Apple TV then Tablo 2 can be an inexpensive option if you don’t mind the configuration, especially if you’re wanting to access multiple TVs. TiVo is the cheapest if either you’re not going to buy a set-top-box device, or if you’re only going to need it for one TV. And really it’s the best all around. I have a Tablo 4, and while I would’ve gotten a Roamio (had they been out at the time I purchased my Tablo) after I got it configured I really found that I liked the interface and the convenience of being able to watch on any device without buying anything extra. In short TiVo is for most folks, Tablo is for gearheads outfitting more devices. Go fourth and configure your system and let me know how it works for you so I can update this post with more info!